For over 25 years I have helped market a number of companies and organizations including The Vancouver Aquarium, The Vancouver Board of Trade, Numerous Shopping Centres, and Que Pasa just to name a few. I still make my living in branding and advertising and prefer to work with local businesses to help build the local economy. In 2012 I decided to use my talents to inspire people to grow a little of their own food. I have always tried to get clients to be bold and dare to be different. I also happen to believe in outdoor advertising (much harder to ignore). But a single transit shelter ad would cost close to $900 for one month. It just so happened that I had my old pick-up truck that had not been driven in six years, parked in the weeds in my back alley. 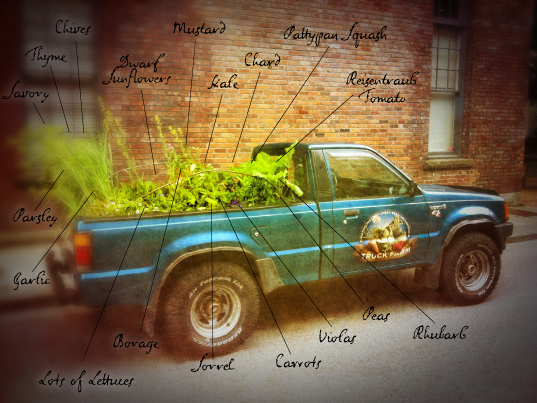 It was in pretty good shape for a truck that old and when I came across the trailer for the movie Truck Farm I was struck by how cool it would be to grow a small space demonstration garden from my own seeds in the back of my truck. 45 minutes later I had applied for a Neighbourhood Green Grant to cover some of the costs to turn it into a Truck Farm. A few weeks later I found out I got the grant and the real work began. Like I said, the truck had not been driven in 6 years. This meant a six year old battery, six year old fluids, including gas and rubber parts that don’t really like to sit around doing nothing. According to a few people I have horseshoes up my behind when it comes to the truck (they used a more colourful term). We put in a new battery and the old girl started on one turn. I drove it to Aircare, and it passed the first time. The rubber parts needed to be replaced but the automotive students at VCC got it done for a fraction of the going rate. So I got some garden variety soil and started some plants for the truck. I then came up with decals in the Strathcona 1890 branding and hit the streets. It has been a whirlwind year. 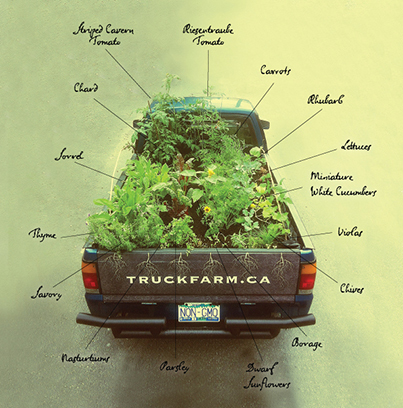 I am able to take my Truck Farm to schools, daycares and community centres to engage, and educate kids. I have various programs where they can learn about growing including my favourite: Growing With Lego. (My philosophy is a heathy version of the one that inspired candy cigarettes – start them young.) 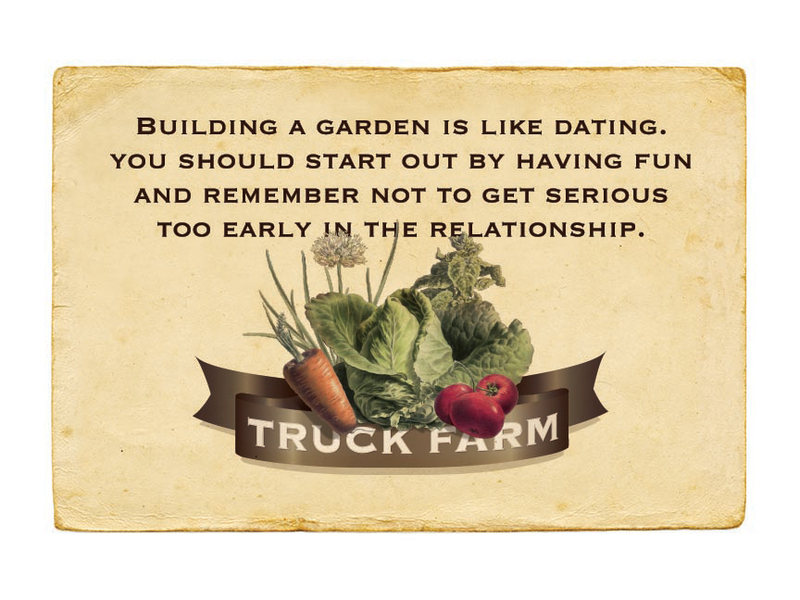 The Truck Farm is now requested for events and exhibits regularly. It has been in the PNE and Science World as well as numerous neighbourhood events and markets. It has had fairly major media coverage, not just in Vancouver, but throughout BC and across Canada.